Bill: Here we have a ten thousand year ko in the corner along with two Black threats. Assuming no ko threats on the rest of the board, now or later, how does this ko fight go? What is at stake? Note: The scoring method matters, because of how points are counted in seki. I will assume area scoring. The initial position has the same number of Black and White stones, so the original count is the same as with territory scoring rules that count points in seki. Black takes the ko. White, with no threat, plays elsewhere. Then Black makes a direct ko. White takes the ko and ignores Black's threat. After the local count is +3 (for Black). White removes one of Black's ko threats. Now Black can no longer convert to a direct ko. Later threatens to do so with sente, however. The resulting local count is -1. How hot is this ko ensemble? 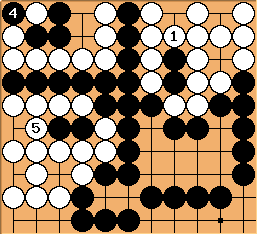 In two net plays Black reaches a count of +3, in one play White reaches a count of -1. Each play, on average, is worth 4/3. This is the same size as the so-called half point ko in territory scoring, just a little more than a Japanese dame. Note how much making the direct ko heats things up. 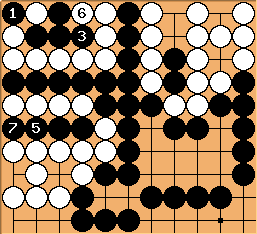 White wins this ten thousand year ko, not by filling it, but by eliminating one of Black's ko threats. Creating and destroying ko threats is typical of this kind of ko fight. With one large threat White can make a direct ko. makes a direct ko. Black wins, but with and White saves her other stones. The local result is +16 by area scoring. eliminates White's ko threat. At the end of play Black will capture for seki. The local result is +20. This ko ensemble has a miai value of 2 by area scoring. Because White can make the direct ko right away she needs only one threat to fight the ko, but because she has more at stake in the ko, she needs a larger threat than Black does.